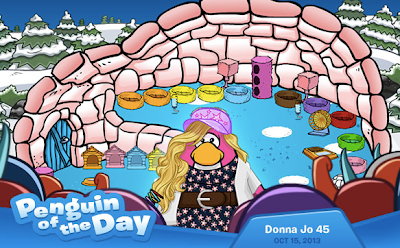 Club Penguin Cheats by Mimo777 Club Penguin Cheats by Mimo777: Penguin of the Day: Donna Jo 45! 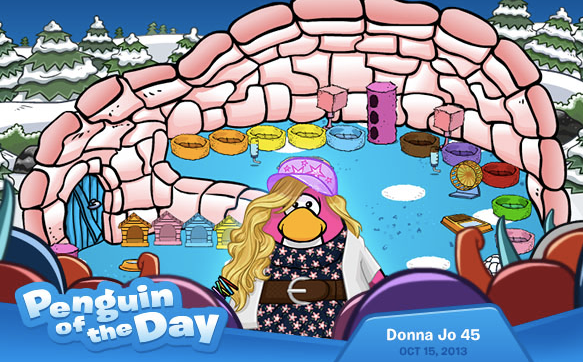 Cadence super-fan, Donna Jo 45, looks up to her idol so much that she’s always on the lookout for her in the Night Club! Check out her glam outfit too, I’d love to know her style tips! Contact Club Penguin to nominate your friends! "I'd like to know her style tips!" Then ask her since she's POTD! Btw she's only POTD only because she likes to dress with popular items and because she has an idol, not because she is friendly at all, also to answer the first quote, just be comfortable with what you wear, you don't need to be the popular guy/girl, just wear what you like.